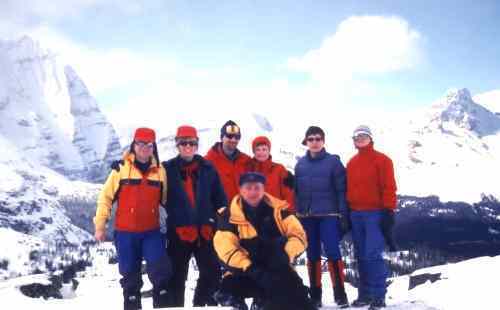 The group at at Elizabeth Parker hut, Feb 14, 1999. 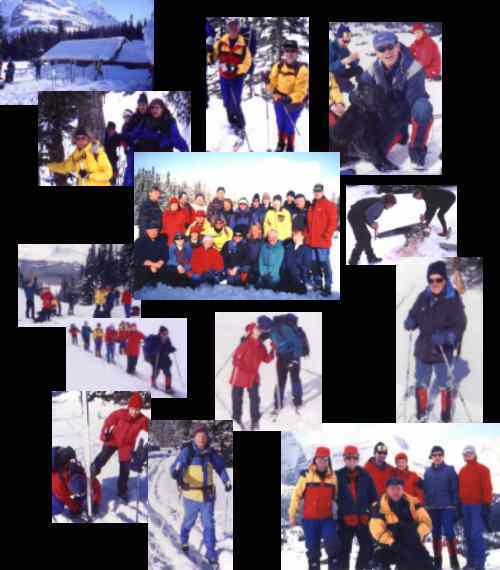 An entrepid party on Opabin Plateau moraine below Opabin Pass, Feb 14, 1999. Mt. Schafer on left, Odaray Mountain on right. This was the eighth year in a row for the Elbow Valley Cycle Club at the Alpine Club of Canada's Elizabeth Parker hut at Lake O'Hara in Yoho National Park in British Columbia, Canada. Please link to the orientation page for this trip for more information. We skiied in with loaded back packs from the Trans Canada Hwy parking lot the first day and spent the rest of the three day weekend around the Lake O'Hara weekend. Gluwein (hot mulled wine, group suppers, the world's best scenery, the best camaraderie, loads of snow, and starry nights characterized our weekend. 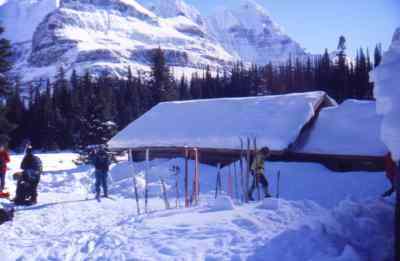 Back country huts and winter environment don't come much better than this. See you next year. At the time of this writing (Sept, 1999), next year's weekend here will be 2000 Feb 5, 6 &7, Sat through Monday. 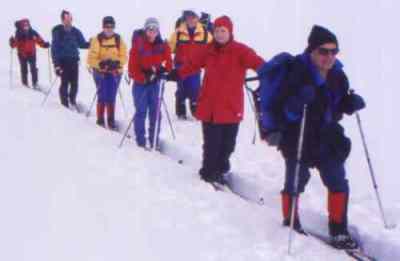 A group of 24 people were almost ready for a three day self-supported ski into Elizabeth Parker Hut. "How heavy is your pack?" "Well if you don't count the 4 kilograms of wine, I think I've got it under 20 kg". "I've never had so much trouble getting all my equipment in my pack." "Yeah, 2 bags of nachos don't pack very well, do they?" "How am I going to pack this baklava and chocolate cake without crushing them?" We were ready! Lake O'Hara is located directly west, across the continental divide, from Lake Louise. 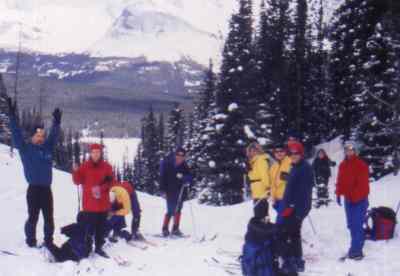 It is accessed from the Trans Canada Highway, just inside the Yoho National Park boundary, coming from Calgary. The approach leads you south along an 11km fire road, which is often tracked. The ski is pleasant and relatively easy, gaining 442 meters over the distance, a 4% grade. Skiers can and do access the area and return in a day, but the destination has too much to offer to simply take a look and leave. While the lodge is beautiful and well worth a visit, our destination was the more affordable, and once again renovated, Alpine Club of Canada's Elizabeth Parker Hut. Upon arrival, 24 people unpacked and began to enjoy the cocktail hour. "What's this cloth thing doing in my gluwein!?" shrieked a horrified gluwein maker. "Oh, I was just reactivating my hand warmer," explained a sheepish, cold-handed skier. "Just how sweet does this honey and wine concoction get?" 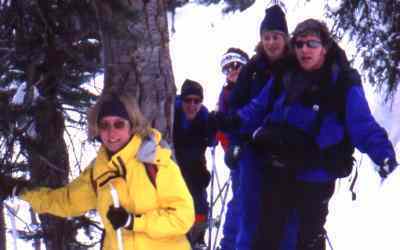 Twenty-four skiers full of fresh air, appetizers and gluwein began to relax and enjoy the atmosphere of a backcountry hut. "O-o-oh, yesss!" The pleasure of a pained skier who managed to attract the pity of massaging fingers to his aching shoulders was heard throughout the cabin. 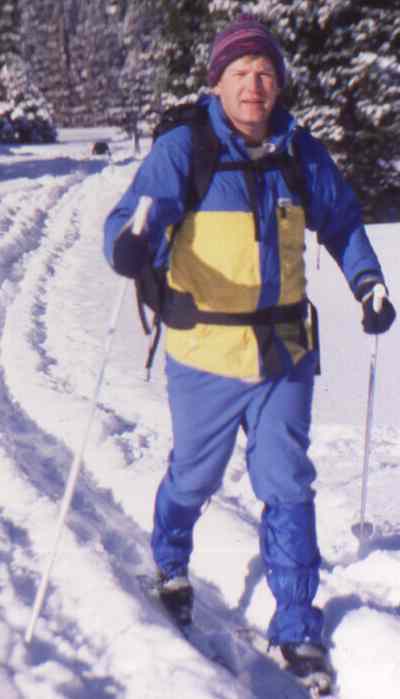 The next day was a ski into the Opabin Plateau. A minor detour en route brought us to Mary Lake. A small lake highlighted with a clear blue sky and bright sunshine. Leaving Mary Lake, we returned to Lake O'Hara where the climb to Opabin began. Upon reaching the plateau, after skinning up our skis, and a steep direct ascent, we were greeted by a safe valley with moraines, mountain cliffs, glaciers, and 220 cm of snow (we checked!). The return was even more exciting. Beautiful soft fluffy snow lent itself nicely to a wild careening descent on uncontrollable skis. After returning to the hut, 24 began to prepare dinner. For 24 people to work in coordination is quite a feat. 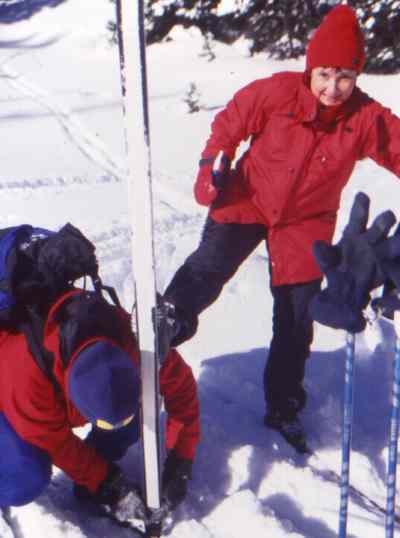 There was water to be fetched from the nearby stream and carried back in waist deep snow. 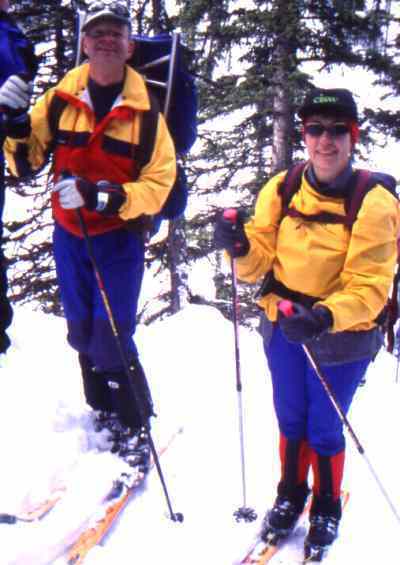 Some of us attempted water duty on skis, which inevitably resulted in returning to the cabin somewhat wetter than when we left. There was wood to be cut which a number of souls attempted with persistence and bravery, given the archaic saw-like implements at their disposal. The kitchen was well supplied and amazingly accommodating for all of us. After good food, good drink, and good conversation, most retired early except for two youthful new acquaintances who were enjoying a "private conversation" in a not so private area. Monday morning was a ski into McArthur pass before heading out. The morning was a classic Canadian Rockies experience. "That was the best hour of skiing I've ever done," was heard from a thrilled skier. 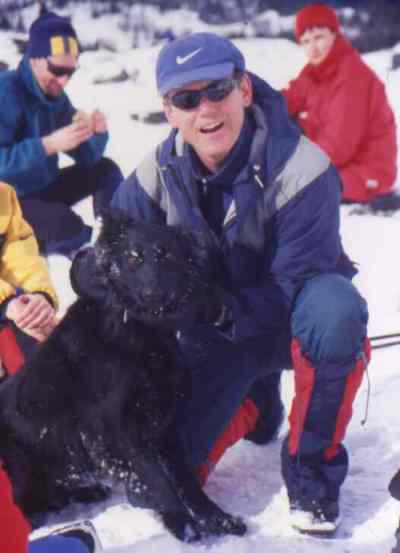 Twenty-four skiers want to thank Peter LaGrandeur, our logistics coordinator, for a highly successful and enjoyable weekend. EVCC is fortunate to have organizers such as him. Elizabeth Parker hut. Yukness mountain in background. Climbing from Lake O'Hara to the Opabin Plateau. Arriving at the Opabin Plateau. 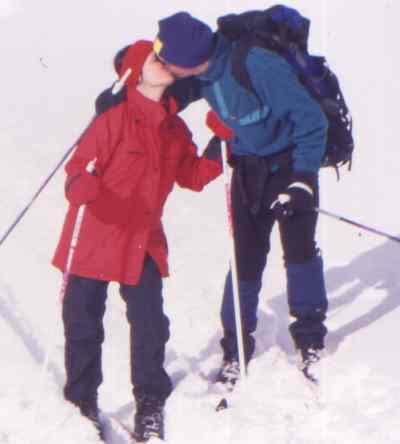 True love on the mountain. Man's best friend. Where is the brandy cask? 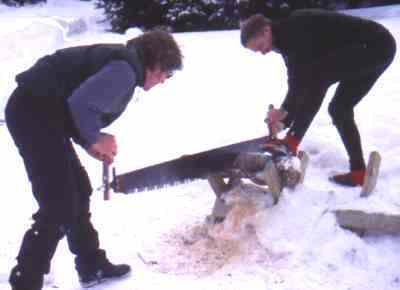 James (L) & Frans on cross cut saw outside Liz Parker hut. Mitchell burning up the trail on the way up to MacArthur Pass. Liz's true love Rod peeling off her skins. 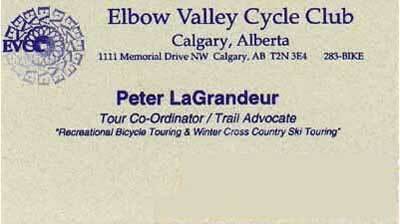 Check out the Elbow Valley Cycle Club's web site by clicking on their icon to the left. 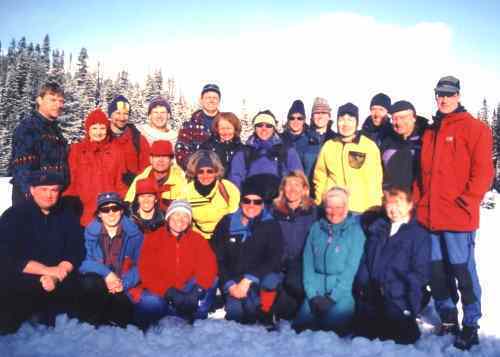 View/download the Elbow Valley Cycle Club's membership form by clicking on the icon to the right.